Home » Blog » News » Great Email From Julia R.
I’m putting together a rather long post from the Sea of Cortez, but while you’re waiting I though you might like to read this wonderful email from Julia R., 13, from Mesa, Arizona. Thanks Julia. You’re the exactly the kind of reader I write for. Hello there Roland! My name is Julia, I’m thirteen, and I am a very big fan of yours. Your books come to life when I’m reading them; I’ve never read a book that’s better. When I moved from California to Arizona in 2005, I was ahead of the other kids, I guess, because California was more advanced than Arizona’s curriculum. In fourth grade i breezed through, getting away with reading small little books. Then fifth grade hit. My teacher was a big fan of reading and since I had never really read a novel, which I hadn’t known meant a chapter book, I very much disliked her class. We read so many novels which pretty much persisted me to dislike reading. I had the same teacher in sixth grade and my love for reading grew stronger in fifth grade because my teacher encouraged it strongly. Although, she was still disappointed in me because I still didn’t like to read on my own time. She had told my mom that at one of our parent/teacher conferences, so my mom took me to the bookstore to buy one book, and that book had changed my point of view of reading. That book was “Peak” by you, of course. I read that book everyday, without putting it down, until I had finished. I loved it so much! I knew that was going to be my favorite book ever! 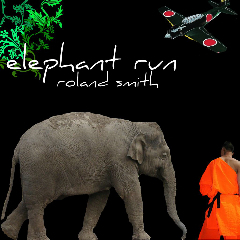 The next year came and I was going through the catalog for the book fair that was coming to school and i saw “Elephant Run”. I had got it, read it, and my brain was torn. It was so amazing that it was going to be my favorite book ever! But then I realized that the spot for number one was already taken and I didn’t know which one to choose. I finally came to a decision: both “Peak” and “Elephant Run” were going to be my favorite books ever! 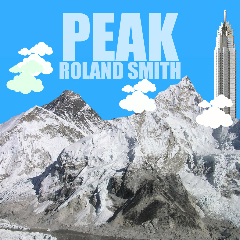 I then was needing an other Roland Smith book to satisfy my craving. So I looked up the list of all your books, went to amazon, and bought not only one but all of them, well at least all your novels! I’ve read every single one of them and now I don’t only have two books in my favorites I have twelve, and waiting for thirteen. Not only am I interested in reading now, but I have also been interested in the arts: drawing, painting, sculpting, photography, and graphic design. So I have combined them, your writing and my art. I just wanted to show you SOME of the things I have done. These are just collages of some of your books. These are the most recent I have read, although they were the first I read. I just finished reading “Peak” for the third time. 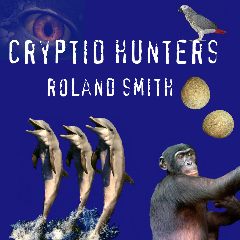 “Elephant Run” and “Cryptid Hunters” I have read twice. 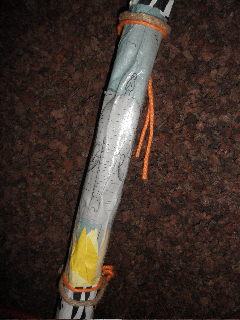 This is a rain stick I had to make in sculpting class. 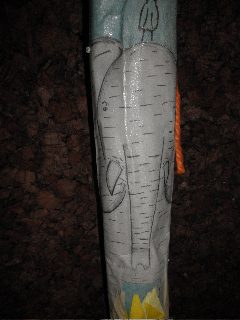 I was reading “Thunder Cave” while we had to make them so I decides to do one with an elephant. I was going to include a cave but i did not fit with measurements we were given. It’s not my best photography but this is one of my favorite pictures. I love this picture because it is probably one of the best lines from any book. 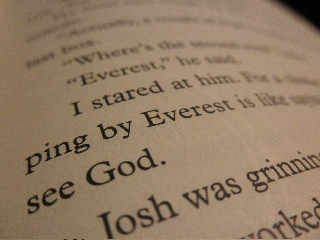 “For a climber, saying that you are stopping by Everest is like saying that you are stopping by to see God.” I mean, I think that is one of the most brilliant smilies ever. I really can say that your books have changed my life. Reading is now one of my hobbies, and that has changed when I first read your books. Not only reading became one of my interests after I read your books, but now I am also interested in cryptozoology. I honestly think it is very interesting. Since I got interested in cryptids, I started watching Discovery and Animal Planet more which has made me more in tune with animals. Now I know I want to be involved with animals when I get older and I am more educated. Your books are a domino effect on me. So, as I hope you see, your books are more then just a way to pass time. They’re an inspiration, to me and I bet many other children who have read your books. Please write back, it would be definitely a dream come true. You are an amazing author! I’d just like to thank you for being the kind of writer that can turn children like my Julia into a lover of books. What she says is true, it was always a battle for her when it came to reading chapter books, and even as a teacher myself, I could not find that spark for her (which killed me being an avid reader myself!). Thank you so much for making a reader out of my girl and for giving her so much to look forward to when it comes to a new book. I look forward to hopefully lighting the reading fire under my own students’ bottoms by introducing your books to them. Every child is turned onto reading by different topics and genres. The author that did it for me was Jean Craighead George with “My Side of the Mountain.” I couldn’t wait to run away and find my own burned out tree! Thanks again for being such an inspiration! Enjoy your writing “vacation,” and we look forward to your future works! Thank you Maria! Julia’s email made my day! you za beast auther ever!!!!!! I mean… you’re the best author ever!! !